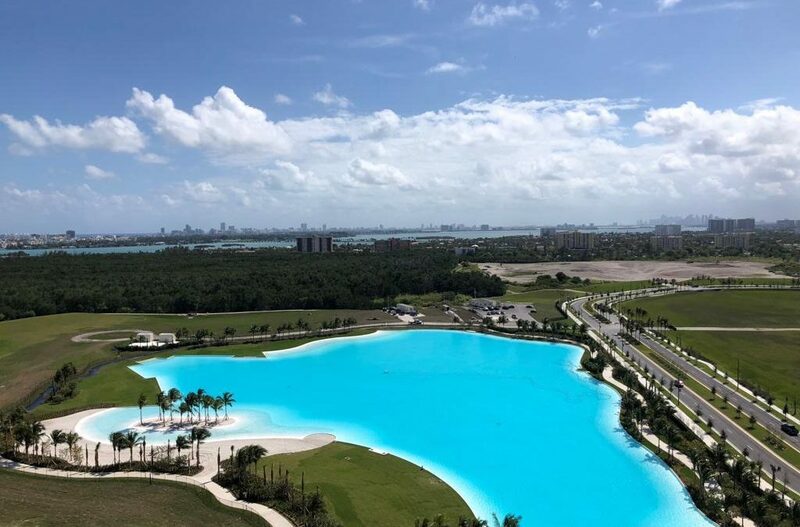 SoleMia is said to have been breaking apartment leasing records in Miami – in part thanks to a massive man-made lagoon built at the development. Since opening seven weeks ago, 82 out of 200 units have been leased. Leasing agents say they feel overwhelmed by the volume of clients the project has attracted in such a short period of time, according to Crystal Lagoons, which holds patents on the technologies used to build the man-made body of water. Units overlooking their lagoon are proving particularly popular. The 3-bedroom units directly facing the lagoon are more popular and on average $300 more expensive per month than those directly facing the ocean but only partially facing the lagoon, Crystal Lagoons said. All the 2-bedroom floorplans directly facing the lagoon have been leased, from floor 7 through 18 (highest floor). In addition to providing views, the lagoon offers recreational activities. Paddle-Boarding, kayaking, pedal boats, water mats and inflatables, noodle floats, sandy beaches, luxury loungers, beach cabanas, and snorkeling are all available at the lagoon, according to the SoleMia website. Eventually, SoleMia will have 4,000 residential units. The next two residential towers, including a 33-story condo with 300 units and another apartment building, are in planning.